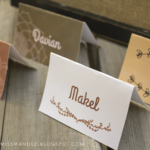 These editable fall place cards are the perfect way to add that personal touch to your fall party. Well hello there! 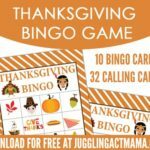 I’m Mandee from Designs By Miss Mandee, and I’m stoked to be a part of the Juggling act Mama team. I’m a graphic designer, and I love to share my work with the people of the inter-web (that’s right, I just said inter-web). 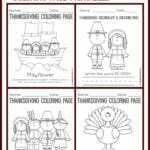 Be sure to check out some of the fun printable freebies and digital downloads I have over at my blog. But first: you need to check out the super cute freebie I have for you RIGHT HERE! 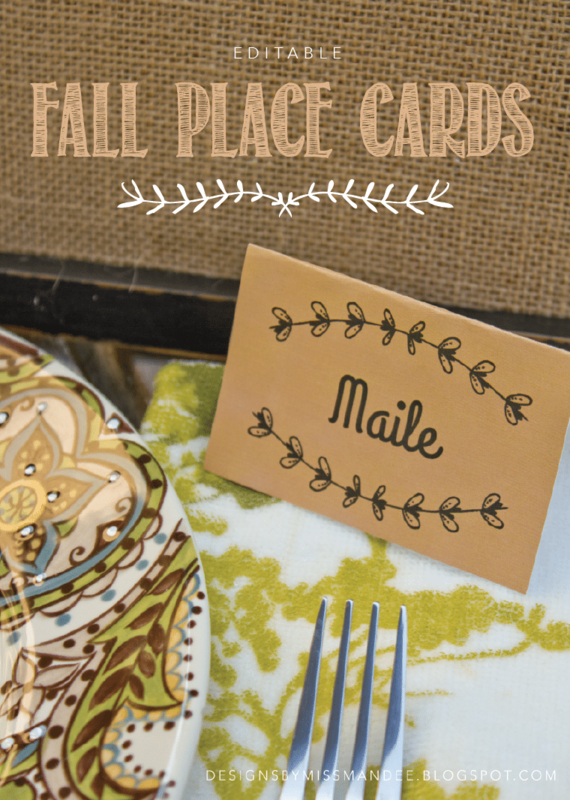 You’re going to love these editable fall place cards. I don’t know about you, but I am loving all the creative fall projects circulating the blogging world at the moment! The pumpkin recipes, Halloween decoration ideas, the lovely fall colors, the whole bit! 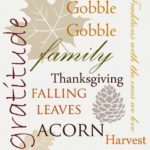 I mentioned in one of my previous blogs that I am not really a fan of fall because of the cooler weather and the sooner the sun goes down, but I’ve gotta’ say, all the fun things people have been sharing lately have really gotten me more excited for that season between summer and winter. But, back to today’s printable freebie. These place cards are so fun, so simple, and it seems like there was one more thing I was going to mention…oh yeah, they’re EDITABLE! Follow these instructions, and you’ll be on your way to the cutest personalized place cards you’ve ever seen. 1. Click the Download button, and save the file in a place you can find it. 2. The font I used for this design is called Grand Hotel. You can Download it here, or choose another font to use. 3. Simply click on any of the four blue boxes to start typing a name. 4. 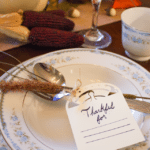 Save your file, and print off your darling place cards! Just want to write the names in yourself? That’s ok, I’m not offended. Just print these puppies off without typing anything, and they will print out without the blue boxes on them. 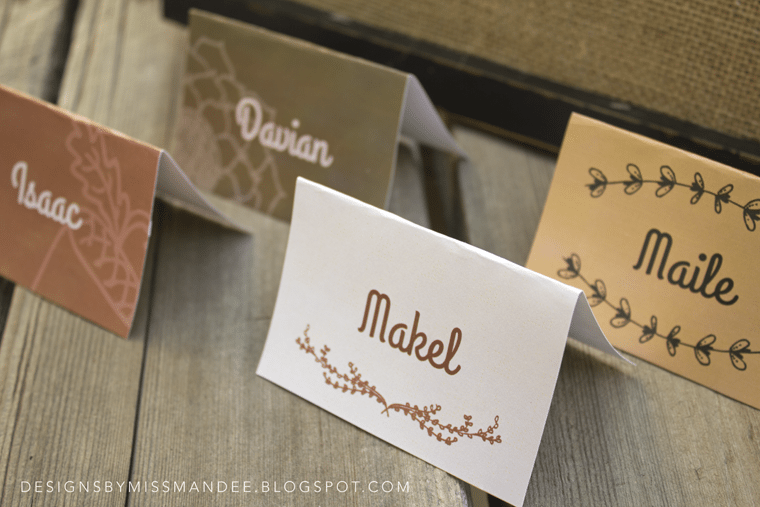 I hope you enjoy these fun fall-themed place cards! For even more fall fun, be sure to check out my fall garland and these super cute fall dingbat fonts! 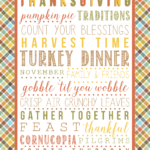 Here are some of our favorite Thanksgiving printables you can download and print! Place cards are a great idea!